I love a good muffin. I really love muffins. I am not sure what it is about that, but I really do love them. I know they are not the most nutritious breakfast or snack so I rarely indulge myself. These muffins were really a nice treat. They are moist and chocolate an are delicious with a cup of coffee or a glass of milk. I am thinking about making a few types of muffins to freeze before the baby comes...but that will require me to actually bake. I need to find some motivation so I can share with you guys. In the mean time, enjoy these! Preheat oven to 400 degrees Fahrenheit. Grease 12 muffins cups or line with paper muffin liners. Combine flour, 3/4 cups chocolate chips, cocoa powder, and baking soda in large bowl. Whisk egg, yogurt, milk, and vegetable oil in another bowl until smooth; pour into chocolate mixture and stir until batter is just blended. 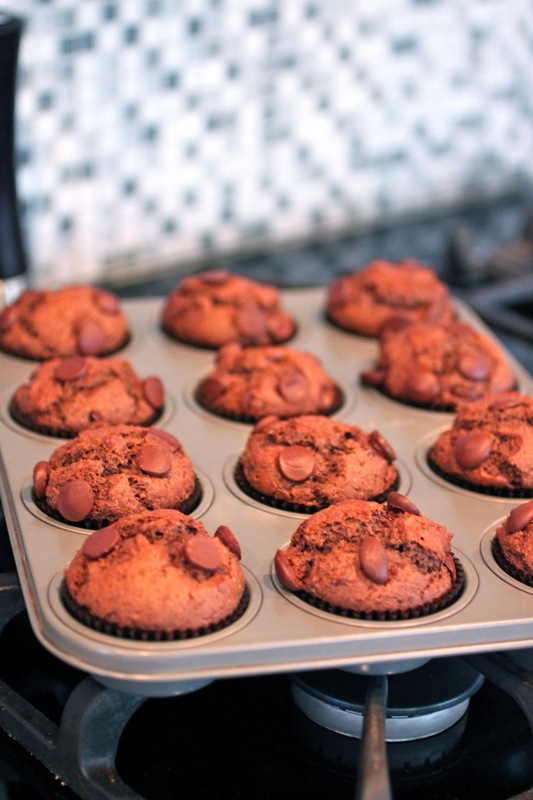 Fill prepared muffin cups 3/4 full and sprinkle with remaining 1/4 cup chocolate chips. Bake in preheated oven until a toothpick inserted into the center comes out clean, about 20 minutes Cool in the pans for 10 minutes before removing to cool completely on a wire rack.